In this moving graphic memoir, Eisner Award-winning writer and artist Michael Kupperman traces the life of his reclusive father—the once-world-famous Joel Kupperman, Quiz Kid. That his father is slipping into dementia—seems to embrace it, really—means that the past he would never talk about might be erased forever. Joel Kupperman became one of the most famous children in America during World War II as one of the young geniuses on the series Quiz Kids. With the uncanny ability to perform complex math problems in his head, Joel endeared himself to audiences across the country and became a national obsession. Following a childhood spent in the public eye, only to then fall victim to the same public’s derision, Joel deliberately spent the remainder of his life removed from the world at large. With wit and heart, Michael Kupperman presents a fascinating account of mid-century radio and early television history, the pro-Jewish propaganda entertainment used to counteract anti-Semitism, and the early age of modern celebrity culture. All the Answers is both a powerful father-son story and an engaging portrayal of what identity came to mean at this turning point in American history, and shows how the biggest stages in the world can overcome even the greatest of players. Michael Kupperman’s comic drawings and strips have appeared in dozens of publications including The New Yorker, Fortune, The New York Times, Nickelodeon Magazine, Forbes, Fast Company, Esquire, Heavy Metal, and McSweeney’s; comic books for DC, Marvel, and others; and been collected in multiple books, including five of his own. They’ve also been animated for Saturday Night Live, Adult Swim, and Comedy Central. Conan O’Brian described him as “probably one of the greatest comedy brains on the planet.” This is his first serious book. Michael lives in Brooklyn with his wife, Muire, and son, Ulysses. "All the Answers isn't just a fascinating slice of pop-culture history, it's also a moving and deeply personal portrait of America's first celebrity know-it-all." 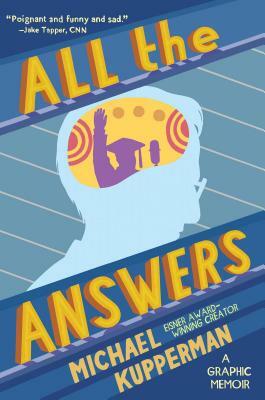 "Really enjoyed reading All the Answers, a graphic novel telling the true story of [Kupperman's] 'Quiz Kid' father. Poignant and funny and sad." "[There is] no book this year about which I have a higher level of curiosity in addition to a high level of anticipation." "In the vein of Alison Bechdel’s Fun Home, Kupperman’s remarkable graphic memoir brings his father—the Quiz Kid himself, Joel Kupperman—to gorgeous, painful life. There’s also some fascinating insights here into the role of radio and television in mid-20th-century America." "It's such a surprising treat to read this thoughtful, pithy memoir." "Tender, brilliant, beautiful, and fascinating. How lucky we are that Michael Kupperman has this story to tell."